I know what you’re thinking: grocery store cinnamon rolls? How could those possibly be any good? Well, stop looking down your nose and open your mouth for a bite, because these are actually pretty decent. When you factor in their sub-$1 price, they turn out to represent a value that’s difficult to beat. Bread is properly baked. Not dry, and not doughy. Tender. Swirls are nicely balanced with the rest of the roll. Frosting is a proper cream-cheese buttercream. Nice flavor. No weird aftertastes. While walking back to my car after a fun morning of skiing at Keystone, I decided I needed a coffee. Starbucks was an option, but across the way was something different: Inxpot Coffeehouse. Turns out they sell more than just coffee: they sell cinnamon rolls. Did I want the roll warmed, the barista inquired? Of course I did! 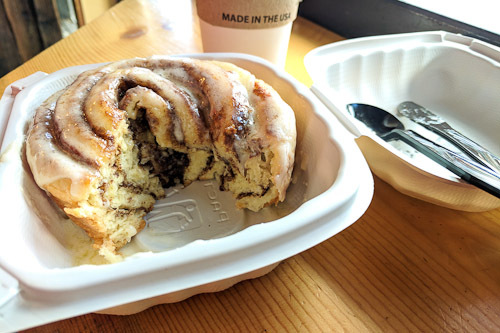 Pretty much every cinnamon roll is better when enjoyed significantly above room temperature. I’m not sure what this one would have tasted like when cold, but when warm it was really good. The bread was fully baked (as opposed to overly doughy or underdone), with a tight crumb and a delightful level of moisture. When pulled, it stretched a bit before eventually giving way. In the mouth, it melted. The inter-swirl cinnamon layers were nicely balanced between sugar and cinnamon, and the texture was smooth, not grainy. The frosting had a cream cheese base. There was a nice buttery accent and perhaps a hint of vanilla without overpowering the other ingredients. No weird off-tastes or aftertastes were present. I’m not sure about the frosting’s texture, since it was all melted by the time it got to me, but it looked nice in the display case. So what was holding this roll back? Not much. It was tasty, and I’ll probably get another one someday. However — and I realize this is going to sound ridiculous — I felt like the roll was lacking the verve of the very best rolls. Maybe it was the relative indifference of the barista to my choice of the roll versus the other pastries (which also looked great). Maybe the problem was actually me: I had just been skiing, so I was hungry, and everything tastes better when you’re hungry. Not sure. If you drive through the seemingly endless plains of eastern Wyoming on I-25, you might eventually arrive in Bill. There are only three stores in Bill: the post office, the Oak Tree Inn, and Penny’s Diner, which is attached to the Oak Tree Inn. 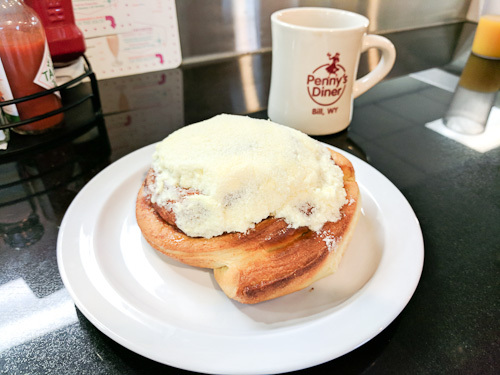 I was in town for the 2017 solar eclipse, and when I walked in to Penny’s Diner for breakfast, I couldn’t help but notice the stacks of plastic-wrapped cinnamon rolls prominently displayed along the counter. I sat down and asked for one. The roll was served at room temperature and looked decent even when the plastic wrap was removed. I didn’t ask if they were baked in-store or off-site, but based on the packaging and the remoteness of the area, I suspect this one was baked on-site within the previous day or two. The slightly tough bread had a decent taste. The inter-swirl cinnamon layer could have been a bit more assertive but was serviceable. Unfortunately, the cream cheese frosting really let down the rest of the roll. The mouthfeel was extremely grainy, and there was a strange vaguely minty aftertaste. I think a trip through the microwave for 15 seconds would have improved everything substantially: the bread would have been softened up, and the frosting would have become smoother.